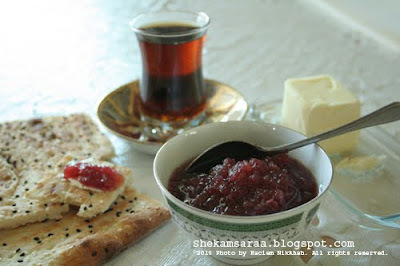 Iranians make different varieties of jams and preserves from familiar fruits, such as apricots, strawberries, and cherries to the not so familiar ones (to the western taste off course) like Seville orange blossoms, cucumber, limes, and carrots. They are consumed with bread for breakfast, or evening snacks, or even served during lunch and dinner as desserts. 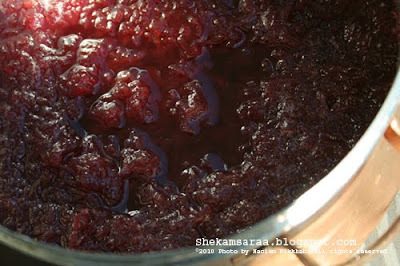 Here, I'm sharing with you the recipe for quince jam. Quince may never make it to the regular fruit platter, because of its sour and astringent taste, but it makes perfect jams. Most recipes for quince jam, tell you to peel and cut the quince, but I like it better if it's grated. Wash and cut the quinces into four, remove the pips and core, then peel and grate them (you can also make the jam with the skin on). Put the grated quinces in a copper pot and add 2 to 3 cups of water. Bring it to a boil then cover and reduce to a simmer, until the quinces slightly cook, about half an hour. Then add the sugar, and whole cardamoms and cover. Let the jam simmer for about 3 to 4 more hours, until tender and richly colored. Add the lemon juice and simmer for few more minutes, then remove from heat. Pour into warm, sterilised jars and seal immediately. من زیاد اهل مربا نیستم، ولی هر از چند گاهی هوس یک جور مربا رو میکنم. پارسال عاشق مربای آلبالو بودم، الان هم عاشق مربای به. مربای به رو معمولا به صورت نگینی خرد میکنن، ولی من رنده شده بیشتر دوست دارم. به را چهار قاچ میکنیم و تخم آن را در می آوریم و پوست میکنیم (میتونین به را با پوست هم مربا کنید). به ها را رنده کرده و در یک قابلمه مسی با ۲ تا ۳ لیوان آب میگذریم به جوش بیاید، سپس در ظرف را میگذریم و زیر آن را کم میکنیم تا آرام بجوشد. تا جایی که به نیم پز شود (حدود نیم ساعت) بعد شکر و هل را اضافه میکنیم و میگذاریم برای ۳ تا ۴ ساعت دیگر بجوشد تا مربا غلیظ شود و رنگ آن به رنگ قرمز خوش رنگی در بیاید. آب لیمو را اضافه کنید و بگذارید کمی دیگر بجوشد. مربا را از روی اجاق بردارد و در شیشه های گرم و استریلیزه بریزید.